I sat down with the folks from the Gateway Hook Company this week to see first-hand whether their patented “easy on/easy off” hook-eye made sense. Gateway, which has been field-testing their design for several years now, has come up with an eye that facilitates the use of a simple slip-knot loop in the end of the tippet to attach or remove small (or large) flies. Anything that makes attaching 6X tippet to tiny flies easy catches our attention (witness the Tightline Magnetic Tippet Threader), so I was eager to put my hands on the product. True to their promise, the eyes I tested were very easy to use. You tie any sort of slip knot in the end of the tippet, loop it over the eye, and slide tight. Gateway touts a simple double sliding loop which is very easy to tie and offers the advantage of making it possible to quickly remove the fly by pinching the knot with your fingernails and sliding it open. Until someone shows me some data on this knot’s strength, I’ll reserve judgment on whether it makes the perfect connection. But the ease with which the system allowed attaching and removing flies was impressive, and if you’re looking for simple, this is it. Especially for those whose sight and dexterity are not what they once were, the Gateway™ should streamline the traditional chore of changing flies in poor light and challenging conditions. 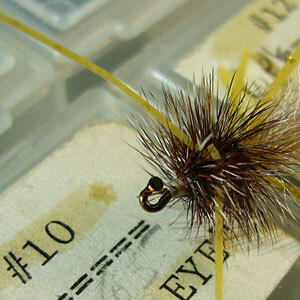 Guides, especially, will probably love it since half their time seems to be spent changing flies and retying tippets. According to Richard (Bo) Hoag, Gateway’s owner, the product line will be available early June 2010.